The following is the script I prepared (slightly edited here) for a presentation I delivered at the monthly meeting of the Lavender Green Caucus (which is the LGBTQIA+ caucus within the Green Party of the United States) on 11 February 2019. This presentation was requested by Gini Lester, Chair of the Lavender Green Caucus. Hello and good evening. I have been asked by Gini to deliver a brief presentation on MMT, or Modern Monetary Theory. Thank you for this opportunity, Gini. So let me begin by making a stunning statement. Federal taxes do not fund federal spending. This is not as controversial as it sounds. Professors of Economics at some of the most prestigious universities in the world are aware of this fact. Pavlina Tcherneva, the Director of the Jerome Levy Economics Institute of Bard College at the University of Cambridge is one such professor, but she is by no means the only one. My own credentials relevant to this include formal training in and a degree in Philosophy, the field from which Economics sprang in the early 20th century, and which still involves the study of Economic Philosophy, as well as some formal training in Economics, History, and other related fields. I will admit up front, however, that I am not an expert in MMT, but I have done considerable study thereof for about three years. So, again, federal taxes do not fund federal spending. You never hear the question "How you gonna pay for that," when the "that" in question is some new warplane or warship, or some new military adventure, because those promoting such things know very well how they're going to pay for it, which is the same way ALL federal spending is funded. Not by taxes. State and local spending are funded by state and local taxes (and in some cases by federal financing), but state and local governments are currency users. They do not issue their own currency. The United States federal government is the monopoly issuer of a sovereign, free-floating, non-convertible, fiat currency. It cannot become insolvent in debts denominated in its own currency. It cannot go broke. All federal spending is funded by Congress authorizing the funds and the Federal Reserve issuing those funds. The federal government does not need to tax or borrow to fund spending. It literally creates its own currency out of nothing. This is not "printing money," which is a term applied to our currency when we were on the gold standard. The vast majority of our currency is not even physical, but rather, a series of ones and zeros in digital accounts. Now, remember these terms, "monopoly" "sovereign," "free-floating," "non-convertible," and "fiat," because one of the simplistic attacks on MMT is a claim that MMTers are repeating a formula which we do not understand when we say these things. I'm going to show you that's not so, by defining these terms. • The US federal government has a monopoly on issuing legal tender in the US, according to both Article I, Section 8 of the US Constitution, and the Federal Reserve Act. No other entity or body within the United States can legally issue legal tender; if they try to do so, they get arrested and charged with counterfeiting. • The currency so issued is sovereign. Sovereign money is legal tender issued by a monetary authority, in most cases by a nation-state's central bank. • The US Dollar, or USD, is non-convertible. That means you can't demand some physical commodity from the government in exchange for a dollar (or $50 or $100 or $500, etc.). • The USD is free-floating. A floating exchange rate is one in which the currency price is set by the forex market based on supply and demand compared with other currencies. This is in contrast to a fixed exchange rate, in which the government entirely or predominantly determines the rate. The forex market is simply the market in which the buying and selling of currencies occurs. • The USD is a fiat currency. This means that it has value because the government says so, that is, because of the government's fiat (from the Latin translation of the Bible, wherein the Hebrew "Yehi aur" or "Let there be light," is rendered "Fiat lux"). Because said currency is non-convertible and fiat, the government cannot become insolvent in debts denominated in its own currency. Because said currency is sovereign and fiat, the federal government has no need to tax in order to fund spending, as Beardsley Ruml, Chairman of the NY Federal Reserve Bank, pointed out and explained in January of 1946. Because the US federal government is the monopoly issuer of said currency, the same government does not need to borrow the currency which it itself creates, for any reason. All federal government "debt" denominated in USD is pro forma. This means that it cannot be called or force-redeemed, and is merely done as a matter of form. And because said currency is non-convertible, when such "debt" is redeemed, the redemption is in the form of the fiat currency. The US federal government cannot go broke or run out of money. The only constraint on spending by the US federal government is resources. Or, as Dr. Stephanie (Bell) Kelton puts it, the federal government can buy every American a pony, if we breed enough ponies. If we get to, or near, full employment, then, and only then, will inflation concerns become a constraint on spending, and will taxation become necessary (not to fund spending, but to offset/control inflation). All of this has been discovered through empirical observation and experimentation. Where rational comes in is where we take these facts and plug them into Deductive arguments to derive conclusions based on these facts through the application of the rules of inference. Deductive Logic works on language the same way Math works on numbers. MMT is "theory" in the same way the theory of gravity is "theory." A theory in science is an explanation that has been tested and widely accepted by experts as valid, rather than an unsubstantiated guess. This is exactly what the T in MMT means, "theory" in the scientific sense. A projection of the potential of our monetary system deduced through a Pure Science. There are two Pure Sciences: Mathematics and Deductive Logic. Another attempted critique of MMT is the assertion of ridiculous claims such as the patently false assertion that we are still on the gold standard, or that our currency needs to be nationalized, or the claim that the Federal Reserve is owned by private banks. These particular assertions have been made by people who advocate for the American Monetary Institute's unnecessary and counterproductive schemes pertaining to our monetary system. These schemes are unfortunately currently a part of our party platform; however, the tide is turning, albeit slowly, and it's important that it turn more quickly, as the Intergovernmental Panel on Climate Change of the UN has issued a report last year stating that we have 12 years in which to ameliorate the worst effects of the coming climate catastrophe. As much as I would like to change our system entirely, we simply don't have enough time to do that AND do what needs to be done to address this coming cataclysm, which will be an extinction-level event if we don't take steps in that 12 year period. I am a Cooperative Commonwealth Socialist. I would love to see the economic system of our nation turned into a Cooperative Commonwealth. I believe it to be necessary. I also realize that the Green New Deal is a much more pressing necessity. While turning our system into a Cooperative Commonwealth is necessary, AMI schemes for our currency are not only NOT necessary, but they would also add more hurdles for us to have to jump to actualize a Green New Deal. With proper application of MMT, we can do everything that needs to be done to make a Green New Deal a reality right now. We simply need the right people in power, people who understand what is possible with our monetary system in its current form. 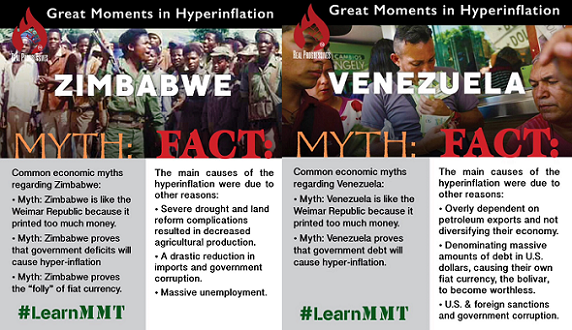 Yet another objection to MMT is made when someone starts talking about the Weimar Republic, Zimbabwe, or Venezuela, claiming that increasing the currency in circulation in those societies led to hyperinflation; however, the hyperinflation in those places was not due to increasing the amount of currency in circulation except in the case of the Weimar Republic, and even there, it was only one of the many factors, and even then, it was because their currency was backed by several physical commodities, including a perishable food item. A fiat currency is backed by nothing but the good word of the government and the willingness of the people to impute value to that currency, the latter being accomplished by taxation. That's the primary purpose of taxation, to encourage the people to impute value to your currency. You see, if you issue a currency and then demand taxes and insist that those taxes can only be paid in that currency, suddenly everybody has to have that currency or they go to jail. But in addition to what I've said about the Deutsche Mark having been backed by physical commodities, Germany lost millions of able-bodied men in the First World War, they had to pay war reparations for the war in the form of French Francs which devalued their own currency, and the French seized control of the Ruhr Valley, which was Germany's primary center for production at the time, thereby making the situation even worse. There are actual constraints on spending, but tax collection is not one of them. The constraints on spending are resources and, once you get to (or near) full employment, the potential of inflation turning into hyperinflation. And there comes the secondary purpose of taxation, to prevent hyperinflation. And if you want the third purpose, that is to keep the wealthy from having too much power over the apparatus of government, which has become a bit more challenging since the Supreme Court decision in the case of Citizens United vs the Federal Election Commission, the earlier Supreme Court ruling in favor of "corporate personhood," and the past 40 years of Neoliberal economic policy. MMT is all absolute economic fact. This is the operational reality of our monetary system, based on empirical observation by economists and some experimentation by the Fed, both of which have been going on since the 1930s. Also, you may have noticed me referring to a physical commodity backing a currency in connection with inflation or hyperinflation. This is a very simple fact of economics which I'm about to explain in very simple terms. If you have 1000 Bars of gold in Fort Knox and $1,000 in circulation backed by those bars of gold, then each dollar is hypothetically worth one bar of gold. One whole bar of gold. Of course this depends on how the government wants to assign the gold relative to the dollar. They might want to only use half of the gold to back the currency, or whatever, but let's say in this hypothetical situation that they're using every bit of the gold to back all of the dollars in circulation. So we have $1,000 backed by 1000 Bars of gold; that therefore would mean that each $1 = 1 whole gold bar. Now let's say that for some reason, and this usually has to do with employment and unemployment, but for some reason, the government decides it needs or wants to increase the amount of currency in circulation and to do so by doubling it. Now we have two thousand dollars in circulation, but unless they have bought some gold bars from someone else or found a new gold deposit, mined it, and melted it down into gold bars, we still only have 1,000 bars of gold in Fort Knox. Guess what that means. That's right; it means that each $1 is now worth half of a gold bar. That is why, when a currency is backed by some physical commodity, increasing the amount of currency in circulation inherently and necessarily devalues the currency. Franklin Roosevelt took us off the gold standard temporarily in 1933, following the lead of the UK which had done so a little earlier. Richard Nixon took us off the gold standard permanently in 1971 when he took the United States out of the Bretton Woods Accord. We no longer have any physical commodity backing our currency, and this is a very, very, very good thing because our currency is no longer chained to how much gold we happen to have at any given moment. That means that our currency can be increased without inherent or necessary devaluation. And I'm sure someone is thinking something about the petrodollar and believes that the United States dollar is now backed by petroleum. This is wrong. "The petrodollar" is nothing but a numéraire. It does not back the United States dollar in any way. A numéraire is a basic standard by which value is computed. In mathematical economics, it is a tradeable economic entity in terms of whose price the relative prices of all other tradeables are expressed. In other words, most oil-producing nations accept USD (and only USD) as payment for their oil. This however has no impact on the value of the dollar itself. It encourages other nations and various corporations to attribute value to the dollar, but the value of the dollar is not in any way dependent on this. "MMT" (Modern Monetary Theory, also called Neo-Chartalism) is science. That is to say, it is a scientific (based on empirical observation, and even some experimentation by the Federal Reserve beginning as early as the 1930s) description or accounting of how a monetary system works when that monetary system is the monetary system of a government which is a monopoly issuer of a sovereign, free-floating, non-convertible, fiat currency. Being scientific, it takes no particular partisan stance and no particular stance on any given economic philosophy. There are some economic philosophies which are more open to it than others. You are not going to find Neoliberals who are going to promote Neo-Chartalism openly, although any Neoliberal who is in an elected or appointed office almost certainly knows very well that it is an accurate description of the monetary system of the United States, the United Kingdom, Australia, Canada, and several other nations. They have their reasons for not promoting it openly, which have to do with ideological biases. Objectivists and Neo-Objectivists are also not going to promote MMT, openly or otherwise, for very similar reasons, namely, ideological biases, but very few of them are in elected or appointed office, and so they simply don't have the experience to understand that it is an accurate description of the monetary system. But yes, there are adherents of several economic philosophies (including varieties of Capitalism, varieties of Socialism, and various forms of Social Democracy, as well as Keynesianism and Post-Keynesianism) who understand MMT and acknowledge it as accurate. By the same token, there are a lot of people who are terrified of MMT for one reason or another, but almost always due to ignorance of what it actually is, and what it actually says. Part of this ignorance is due to propagandists misrepresenting MMT intentionally. The American Monetary Institute, for example, which has a number of unnecessary and counterproductive schemes for "socializing" the dollar, spew the most amazing conspiracy theories about MMT, and the more I hear of what they have to say, the more I am reminded of the John Birch Society and its paranoia about international financiers. I have also had Marxists insist to me that MMT is a Capitalist plot to stay in power and in control of the wealth. "An Act To provide for the establishment of Federal reserve banks, to furnish an elastic currency, to afford means of rediscounting commercial paper, to establish a more effective supervision of banking in the United States, and for other purposes." It's really not that difficult to understand. There are certain empirically-established facts. Once you know those facts, you can see clearly what MMT is and that it is an accurate description of our monetary system. You can also see that Post-Keynesian MMTers have made projections about what is possible with our monetary system, but it isn't simply Post-Keynesians who have made these projections. Beardsley Ruml said some of the same things. Even Keynes said some of these things later in his life. People seem to believe that we have to wait for something to happen or to reach the unreachable star before we can do what we need to do. But what we need to do can be done right now. There's no need to wait for someone to do something, no need to wait till "the stars are right," no need to accomplish the impossible. What we need can be done. Right now. Modern Monetary Theory is, as I have said, a "theory" only in the same way that the theory of gravity is a "theory." MMT is an empirical account of the operational realities of the monetary system we already have. It does not have to be implemented. It's already the way things are done. It is a description of what is, and it opens a door through which we can see what can be done with the monetary system we already have. What needs to happen? What needs to be done? What do we need to do? We need to educate the people about the operational realities of our monetary system and show them the open door and what can be seen through that door. Then we need to lead them by example, by walking through that door and inviting them to follow, and going through that door means insisting that our elected representatives use our fiat currency for people, planet, and peace, rather than to continue to enrich the already obscenely wealthy. Thank you for your time and attention. This concludes my presentation on MMT. L. Randall Wray - Modern Money: The Way a Sovereign Currency "Works"
Does MMT Have Any Scholarly Validity? Warren Mosler = Responses to "How are you going to pay for it?" The Dangerous Myth of "Taxpayer Money"
Stephanie Kelton: Can We Afford a Green New Deal? Matthew Forstater: Functional Finance and Full Employment: Lessons from Lerner for Today? All original content in this article is © Copyright 2013–2019 & an. seqq. by Giovanna Laine, who grants Real Progressives™ a non-exclusive license to publish the article in perpetuity so long as (a) the substance of the article remains unaltered, and (b) this copyright notice is attached. Do We Have Free Journalism?